Крест, на котором обычно располагается SCP-2127. Photograph taken while subjects were within SCP-2127-1. **Особые условия содержания: ** The shrine that SCP-2127 rests upon, and the surrounding area, are to be shut off to the public on grounds of restorative construction. Крест, на котором располагается SCP-2127, и прилегающая территория должны быть закрыты для посещения под легендой реставрационных работ. No fewer than two guards are to be present at all times. На территории должны постоянно присутствовать не менее двух охранников. If a civilian attempts to come into contact with SCP-2127, guards are to detain said civilian for questioning, administering a class-C amnestic afterward. Если гражданское лицо попытается вступить в контакт с SCP-2127, сотрудники уполномочены допросить нарушителя, с последующим применением амнезиака класса C. If a civilian shows any knowledge of the properties of SCP-2127, or of the existence of SCP-2127-1, guards are authorized to administer class-B amnestics as necessary. Если нарушители/гражданские лица? выказывают осведомлённость о свойствах SCP-2127 или существовании SCP-2127-1, сотрудникам разрешается применять амнезиак класса B при необходимости. Описание: SCP-2127 is a sheet of paper that sits on the ledge of a memorial shrine in the hamlet of Kaifeck, Germany. SCP-2127 - это лист бумаги, приклеенный к краю мемориального памятника в посёлке Кайфек, Германия. The words “Who dunnit! ?” (sic) are printed on the paper in the Comic Sans MS font. Фраза "Ктоэтосделал!?" (sic) напечатана на бумаге шрифтом Comic Sans MS. When a subject or subjects pick up SCP-2127, it is activated and they are instantaneously transported to SCP-2127-1. Когда субъект или субъекты берут в руки SCP-2127, объект активируется и они мгновенно перемещаются в SCP-2127-1. After each occurrence of SCP-2127 being activated, the paper will reappear on the ledge of the shrine until a subject or subjects come into contact with it again. После каждого случая активации SCP-2127, лист бумаги снова появляется на краю мемориала, до тех пор пока субъект или субъекты снова не войдут с ним в контакт. It should be noted that a maximum of two people can be transported by one instance of SCP-2127. ???? Based upon information available in the Foundation database, along with public records, SCP-2127-1 is a replica of the farmstead Hinterkaifeck and the surrounding towns, Ingolstadt and Schrobenhausen. На основе информации, доступной в базах данных Фонда и публичных источниках, SCP-2127-1 является копией фермерской усадьбы Хинтеркайфек. The only characteristic that keeps SCP-2127-1 from being an exact representation of the area, based off of photographic documentation and reports from subjects introduced to SCP-2127, is the complete absence of human life save for the bodies of six unnamed people; three women, one man, and two children. Единственное свойство, которая не позволяет считать SCP-2127-1 точным воспроизведением указанной территории, основанное на фотографиях и показаниях субъектов introduced o SCP 2127 , является полное отсутствие признаков человеческой жизни за исключением тел шести неизвестных людей; трех женщин, одного мужчины и двух детей. 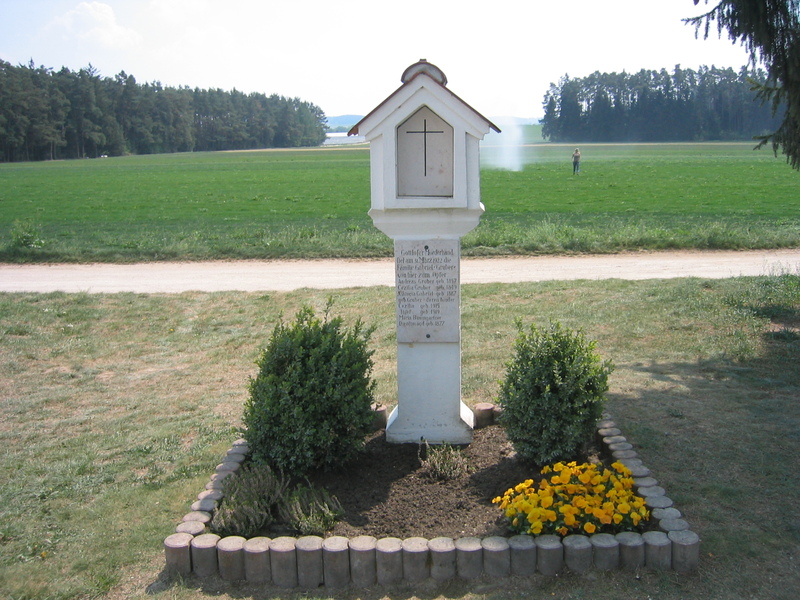 Records show that a family of five, along with their maid, were killed in Hinterkaifeck on March 31st, 1922. Согласно записям, 31 марта 1922 года в поместье Хинтеркайфек были убиты семья из пяти человек Calendars within the farmhouse show the date to be April 1st. Календари в доме показывают дату 1 апреля. The presence of these calendars, along with the fact that the farmstead is still standing in SCP-2127-11, point to SCP-2127-1 taking place the day after the killings. Даты на календарях, наряду с фактом, что усадьба все ещё находится в SCP-2127-1, указывают на то, что события в SCP-2127-1 происходят на следующий день после убийства. It is worth noting that the shrine that SCP-2127 rests upon while inactive is dedicated to the family in question. Заслуживает внимания тот факт, что памятник, на котором располагается SCP-2127 в неактивном состоянии, посвящен этой семье. After containment by the Foundation, two D-Class personnel were sent into SCP-2127-1: one male, age 24 at time of testing, and one female, age 31 at time of testing. После постановки объекта на содержание, двое сотрудников класса D были отправлены в SCP-2127-1: один мужчина, возраст на момент проведения эксперимента - 24 года, и одна женщина, возраст на момент проведения эксперимента - 31 год. As a control experiment, the D-Class were instructed to stay within four square yards of the spot they materialized in for the duration of their time within the anomaly. During debriefing, both subjects stated that once they were within SCP-2127-1, all color was absent, replaced by only black and white. The sound of jazz music was also noticed by both personnel upon entrance. В контрольном эксперименте сотрудники класса D были проинструктированы оставаться в пределах четырех квадратных ярдов от точки их материализации на протяжении всего времени, проведенного в аномалии. В своих отчетах оба субъекта утверждали, что как только они прибыли в SCP-2127-1, все цвета поблекли, замененными на оттенки черного и белого. It was discovered through this experiment that female subjects materialize in SCP-2127-1 wearing a gray dress, while male subjects appear wearing a dark pinstripe suit and a gray trilby. This attire has been consistent in later tests. Both the suit and the dress bear badges for the Munich Police Department. The two D-Class observed no strange characteristics in the clothing. 00:00 - Expected jazz music begins immediately. Agents head toward the barn, where four of the six bodies are known to be located. 01:14 - Areas in which the bodies are located have all been reached, with no pieces of evidence found. It is noted that the farm animals have been fed, and coals are observed still burning in the fireplace. 01:40 - On the way back to the farmhouse after briefly exploring the field directly north of the farmstead, where the Agents believed they saw movement, Agent Keller trips on a shard of cast iron embedded in the ground, uncovering a set of footprints described as “charred into” the frozen ground, presumably hidden by a fresh snowfall the night before. Agent Jackson reports that the jazz music that was playing constantly in the background grew noticeably quieter when this occurred. 01:53 - It is discovered that the footprints, which appear to be those of bare feet instead of the expected boot prints, originate from the basement window of the farmhouse. Agents enter through the front door, making their way to the basement entrance. 02:02 - After much struggle, the Agents are able to open the door to the basement. The lock of the door, thought to be the source of the struggle, is easily broken; it is discovered that a mattock was used to prop the door shut. The wooden shaft was snapped under the pressure of the Agents’ efforts to open the door. 02:16 - After thoroughly searching the basement of the home, which contained a cot that “smelled like someone used it as their john for a good week”, the Agents left the home to head into the woods. 05:29 - Just short of 5 and a half hours into the expected 24, Agent Jackson appeared back at the shrine, in the clothing he was wearing beforehand as expected. On his person was a sheet of paper, the same proportions as SCP-2127, reading “You did it, detective! Thank you for playing 'Who Dunnit? : Hinterkai-fun! Edition’”. After discovering that the Agent was unconscious, supervising researchers immediately transported the agent to a nearby hospital, where he was admitted under the guise of a construction accident and treated for internal bleeding and three broken ribs. Note from Dr. ██████, overseer of SCP-2127 exploration: The events of the roughly 3 hours between when Agent Keller and Agent Jackson left the basement of SCP-2127-1 and when Agent Jackson returned to the shrine are unclear, as Agent Jackson’s report of the events from that point on have varied greatly. The means by which the Agents entered the forest has been reported by Agent Jackson as “We walked into”, “We were pulled into”, and “He had been seeing us having been called into” on different occasions. The latter of the three reports was deciphered from Agent Jackson’s mostly unintelligible rambling directly after the incident. Due to the intensive therapy that Agent Jackson needed to undergo to extract the information currently available, interviews are suspended until further notice. It can be reasonably assumed, however, that Agent Jackson discovered the perpetrator of the murders, as SCP-2127 did not reappear after this exploration. On June 1st, 20██, approximately two weeks after the final test on SCP-2127, two VHS tapes were delivered to Dr. Marten’s Foundation mailbox. The means by which the tapes arrived there is unknown. Each tape bears the text “Hinterkai-fun custom VHS set - Reissue of the classic nor [sic] film!! !” handwritten in black felt-tip marker. Research is currently ongoing into if other copies of the tapes exist, and evidence of such tapes is to be immediately reported to Dr. Marten, or any personnel of level 4 clearance or higher. The contents of the tapes are footage of Agent Keller and Agent Jackson while within SCP-2127-1. Although Agent Jackson didn’t report any cameras present within SCP-2127-1, there are many shots where the camera would have been visible to both agents. The first VHS tape shows the series of events from when the agents materialized within SCP-2127-1 until their breaking down of the basement door in the farmhouse, at which point the screen fades to black, and “THE END” is shown. The second of the two tapes is marked “bonus footage” on the spine, also in black felt-tip marker. Although the footage on the second VHS tape is of noticeably worse quality than the first, with audio and video cutting out sporadically, it appears to show the agents leaving the home, as well as portions of the events after they enter the forest. Approximately 20 minutes into the tape, a section of footage occurs which shows Agent Keller being caught in a primitive rope trap while the agents are making their way through a section of dense underbrush. After attempting to free Agent Keller for approximately one minute, Agent Jackson retreats to the farmhouse, locking himself in the maid's bedchamber. It can be deduced that the agent is being pursued, as he frequently makes backward glances as he is approaching the home. The sound of scraping metal can also be heard while Agent Jackson is within the maid's bedchamber, presumably emanating from outside the door. Shortly after the agent realizes that he is without his pen and notebook, with footage showing that they were dropped in the forest, audio and visuals cut out for five minutes and six seconds. When audio and video are restored, Agent Jackson is seen jumping frantically at an unconscious Agent Keller. What appear to be severe burns are present on the face and forearms of Agent Jackson; the reason for these burns not being present at time of return is unknown. Keller's notebook is seen falling out of his suit pocket, and Agent Jackson absconds with it. Approximately 15 seconds after Jackson exits the shot to the left, an unknown entity, temporarily deemed SCP-2127-2, enters to the right, apparently in pursuit of the agent. Although the poor quality of recording and rate of movement of the subject make it difficult to make out characteristics, SCP-2127-2 appears to be holding half of the mattock used to block the door of the farmhouse basement. Approximately ten seconds after SCP-2127-2 exits the frame, the video cuts out, with 20 minutes and 17 seconds of tape left on the supply reel. During playback of this "blank" section, distressed vocalizations can be heard intermittently. It is not known whether these vocalizations are those of Agent Jackson, SCP-2127-2, or some unknown third party. Research into evidence of SCP-2127-2 within a 2-kilometer radius of the shrine where SCP-2127 was formerly situated is currently underway. If any evidence is found of SCP-2127-2 either having been there or currently residing there, the information contained in this addendum is to be immediately made open to all clearance levels and upgrade to Euclid class is to be considered. Due to information made available by the VHS tapes, Agent Keller's status is to be changed from MIA to KIA. Researchers wishing to gain access to the VHS tapes are required to acquire written permission from two personnel of Level 04 Clearance or higher. Research of the tapes by Dr. Marten is ongoing in an attempt to discover in more detail the properties of SCP-2127-1. 1. The original buildings were demolished the year following the murders.